1. Have a sleep ritual. Go to sleep as soon as you can after work. Don’t get caught up in chores, errands, and scheduling. Save this for later when you can devote your full attention to them. Come home from work, relax in the bath with a book, and then hit the hay. 2. If you are exposed to a lot of sunlight right after work, your body will perk up and make sleep difficult. Don’t stay outside longer than necessary before bed and make your room as dark as possible, even if you must resort to blinds, curtains, or a sleep mask. 3. To keep disturbing noise to a minimum, invest in a good set of ear plugs. Unplug the phone in your room. Talk to your family members about taking extra care to be quiet. 5. Avoid caffeine. It might help you make it through your shift, but if you drink coffee too close to bedtime, you’ll have a terrible time trying to fall asleep. 1. Don’t eat a huge meal right at the end of your shift. It will just sit in your stomach as you try to sleep, leading to trouble digesting as well as disrupted slumber. Your body will have difficulty burning these extra calories and they can turn to fat. 2. Drink plenty of water throughout your shift. Dehydration can cause cramps and headaches, which can make your shift very unpleasant. 3. Fuel up on complex carbohydrates; these will release energy slowly over a long period of time, versus quick sugar bursts that won’t last too long. Also, protein will fuel your muscles throughout the night. 1. Try to relax, make sure that your heartbeat is on a rest pace or beat. It will help you if you’ll control your breathing. Don’t excite yourself by thinking of stuff. Try to meditate. Concentrate on something solid, imagine you are looking at a black dot in a middle of a white board. This will relax your mind and help you sleep. 3. If you need to commute when going home, make sure that no matter how sleepy you are, you will not sleep in the Public Utility Vehicles. Aside from it’s not advisable due to security and all, you will loose your “sleepiness” because you will get the “power nap” couple of hours before your intended sleep. 4. Speaking of power nap, (power nap-napping or sleeping for at least 15-20 minutes) if you need to do this, make sure that it’s in the middle of your working hours. It will revive you for the rest your shift. But if done during commuting hours, it’s a no-no. Share if you have other inputs on how to be a healthy you while working on a night shift. UPDATE: Thanks to BonnieWrightonline for featuring the pics I’ve taken. Love the site! Always updated with the latest Bonnie/HP news! Very cool staff! I would suggest to my new Fitness First Buddies to try out the SM North Edsa branch! Go! Go! Go! So enjoy the pics. I really love the Bonnie/Ginny pics. Enjoy! Click pics to enlarge! The over all look of the poster…. Who have not seen yet the Pirates of the Carribean at The world Ends? I’ve seen it last Sunday with Alex. One of our rare movie dates nowadays…hehehe. So. For the movie review, since I’ve seen all three pirates movie, let’s rate the pirates! Why I liked Part 1 than the rest? Simply because of the staunding effects that made me wanna wait for the remaining 2 parts of the saga. And, the story line and plot was very good (understandable.. :). And I simply love Johnny Depp (but that’s bias since I loved him since from the Edward Scissorhand’s). Ha-ha! What a fitting title! I feel most stressed right now. Maybe because I was not getting enough rest and sleep. Maybe I need couple of days to relax and be away from work. Maybe I need a full-body massage. Maybe I need to write more or maybe I need to laugh more. This is an old news already. A call center agent died because of stress. Kaya ayokong ma-stress. Hehehe. A friend suggested me to try the Nuga Best. They say it’s good and relaxing. You’ll get tons of healthy benefits from doing Nuga and most of all it’s for F R E E !!!! Yahoo! hehehe… There’s a branch there in Libis, walking-distance lang from the office. I hope I could visit the place soon! I can’t really tolerate pain. Ang sakit talaga promise! It hurts a lot! Sobra! Nasusuka ako sa sobrang sakit! ARAAAYYYY!!! I had this foot warts or in more common term as “matang isda” for couple of weeks na. It’s more painful every morning after taking bath and when I’m walking long distances. So last Saturday, I decided to have it removed. So far, I don’t know if the pain was worth it. 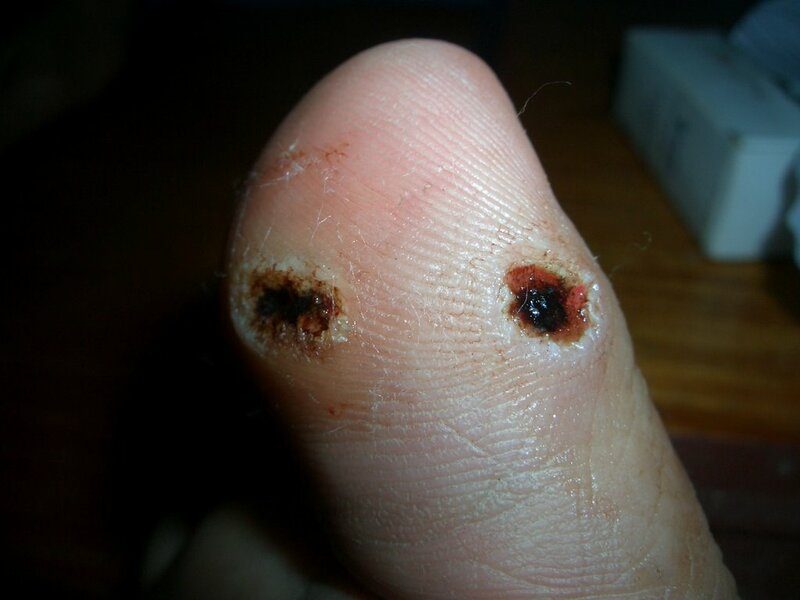 On my right foot, I got 8 warts and 3 on my left. I wasn’t able to take a picture before I had it removed so I don’t have a reference. So I went to the hospital, which was accredited by our company’s health insurance, in Eastwood. The doctor informed me that the anesthesia was the most painful part of the procedure, and I should have never doubted her. Sobrang sakit talaga. After she applied the anesthesia, she cauterized the wondered part and then scratched or ‘kinayod’ til it bled. After that, she cauterized again to stop bleeding. It was really painful after that, possible that the anesthesia stopped working. But it really made me cry. I drank mefanamic acid, but it did not take affect after 45-minutes or so. So it was really painful…GRABE! According to Dra. Herredia, it will only take couple of days and I could walk normally again. Sana, I’ll be fine sa Christmas Party on the 13th. I’m so lucky that Malen and Janice was with me that time. They helped me to ride the cab and bus. Thanks to Alex as well for fetching me home. Thank you din Lord for the strength…GRABE! 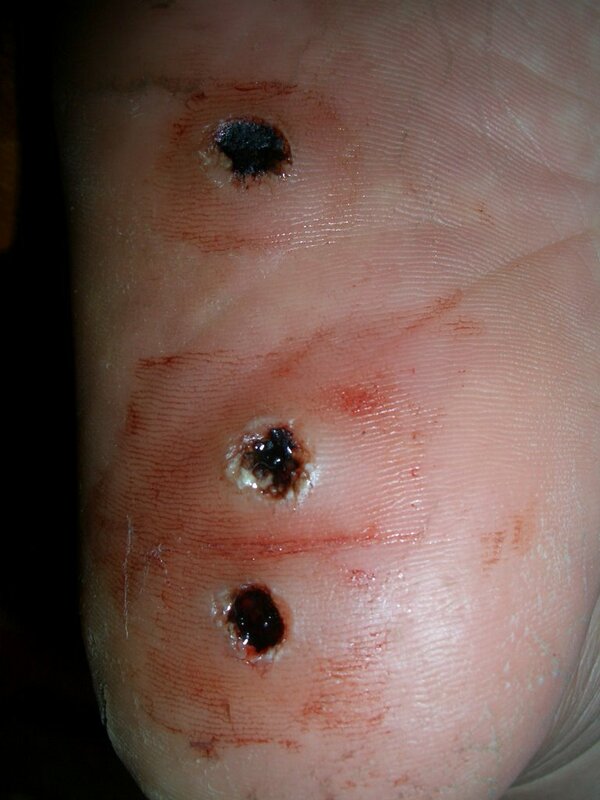 WARNING: If you have strong stomach, you can see the pics below of my foot warts after they had been cauterized. After 12 years since I posted this blog, I still receive questions on how people can self-medicate to heal their “matang isda” or foot warts. Disclaimer: I am sharing what happened to me and it’s still best to seek professional help from dermatologists. So, here’s what I did to my other foot, the left one (not cauterized) and after just five-seven days of repeating the same process. It all healed, without the pain and hassle of the cauterizing process. Up to this day, the wart did not re-occur. Thankfully! So here’s the procedure which was also posted on the comment around 2010. The good thing is, it really contests the virus from spreading…so gagaling talaga sya. PRAMIS! I only treated my left foot for 5 sessions and tyaran! gumaling na agad sya. 1. Maghugas ng paa. Gumamit ng Safeguard white for anti-bac (not advertising, pero share ko coz eto kasi ung ginamit ko). Make sure na hindi gagamitin ung sabon sa iba pang katawan, so buy the smaller one. 2. Ibabad ung affected na paa for about 20 – 30 mins. sa maligamgam na tubig with alcohol. 4. Then you cover it with the tape. Yung ginagamit for wounds na parang brown tape na makapal pero para sa sugat or ginagamit together with gauze. Gupit gupitin para eksakto lang sa kulogo. 5. Then pag gising sa umaga. Tanggalin ung tape, then you’ll see your kulogo na parang dead skins. tanggalin ung dead skin using the nail cutter. Be very careful, huwag paduguin. Ung dry skin lang ang tanggalin. Leave comments if you’ve tried this and if it worked.